I am having an issue with the Ja News Pro module showing unpublished articles. I don’t see any settings in the module for this. 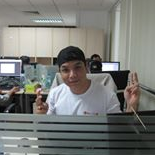 @sly123: Can you try to update the latest version v2.5.9 of JA News Pro module ? Then try to configure the available module settings. I guess you are using Joomla 3.2.x with the out-of-dated update of this module. Very strange (we must empty trash, and after that, it is ok). @dieudonne: You can try to update the latest version of this module and configure to No caching in Advanced options tab. Do not forget to inform me how it goes. I have the latest version installed 2.5.9 and caching is disabled and I still have this problem. @sly123: In this case, you can backup your website and PM me the site’s credentials. I will help you to check out this issue. 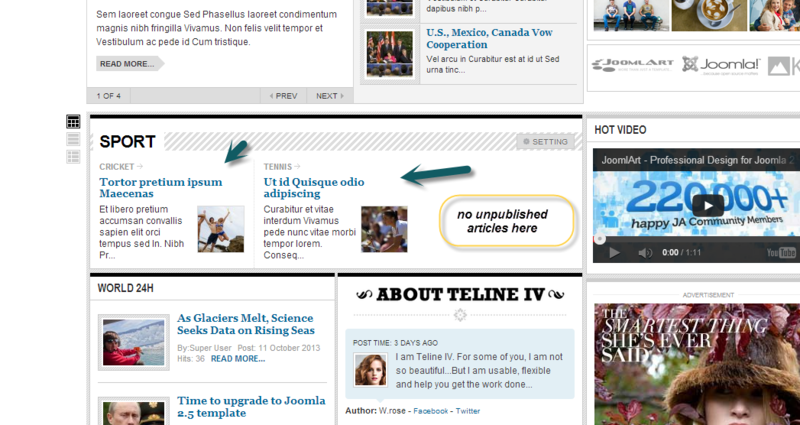 I tried to test our the JA News Pro module on Teline IV demo, but unfortunately I could not reproduce the same issue. The articles that are causing the problem are the link items. The articles in the first column once unpublished are removed. It’s a problem with articles in the second link items section that are causing the problem. Could you test that by adding a few articles to the link items column please. @sly123: If possible, please backup the site and PM me admin login credentials? I will be happy to take a look and give you a suitable solution on this. Alternatively, you can capture a snapshot how the unpublished articles are displayed on this module at your end, I will try to reproduce it and find a fix then. Ok I pm’d the info please let me know what you come up with. @sly123: Thank you for sending me the admin login and a detailed snapshot. In fact, this issue is related to our JA Extension Manager component when I did not update our JA News Pro module properly. That is why you got the problem with unpublished articles. I just tried to update the latest version of this module manually again and you can see that these News Pro module works fine without displaying the unpublished articles. Can you check out it again and back to confirm me the result at your end ? I just checked and I still have the same problem. If you look at the House League News category you will see the unpublished articles are still appearing. I think it has something to do with the date range. If I select to show articles from 6 months back it shows published and unpublished articles. If I change to date to 7 months back they don’t show up. It looks like a problem with the code code for the date range. @sly123: I confirm that I saw this remaining issue of News Pro module on your website. However, it is really weird that I could not reproduce the same issue of this module on both JA Mitius and JA Teline IV, even i tried to duplicate the same module settings of your site. Well, lets wait me some time to ask our extension developer to check out this module on your website. I hope that he can give you better solution on this. Thank you for your patience ! Leo has there been any progress on this issue? I have tested the JA Newspro module issue you mentioned directly on your site. That’s reason why your site still display unpublished articles. You need to clear cache after making any changes. To clear cache, simply navigate to Admin site -> Site -> Maintenance -> Clear Cache -> select all and click Delete button.